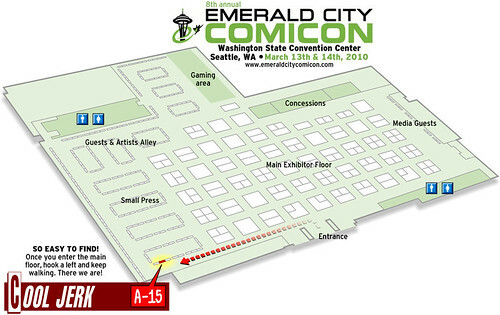 So yes, Team Cool Jerk will be at ECCC the weekend of March 13 and 14, in the Small Press area. I whipped together a map showing the quickest route to Cool Jerk! Click it to Sasquatch-size it! I’ll have stacks of Cool Jerk collections Hodabeast and Chickadoowa on hand, as well as Doc Splatter Ominous Omnibus (NEW since last year)! And speaking of new, how about T-shirts? Awhellyeah. 24-Hour Comics? You betcha. Buttons, Post-It notes & sticker sheets? But of course! And as always, I’m ready to add some original art to your sketchbooks, too!